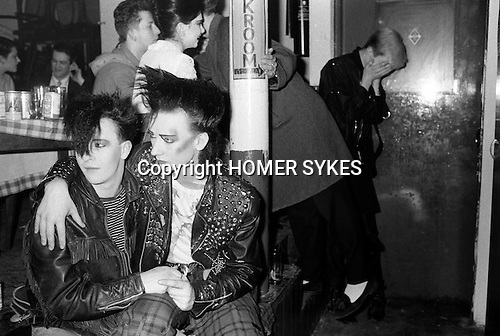 New Romantics, George O'Dowd, later known as Boy George with friend Wilf Rogers at The Blitz Club, Covent Garden, London. 1980. George O'Dowd, later know as Boy George, with friend Wilf Rogers at the Blitz Club, where George was working as the cloakroom attendant. He is wearing a Malcolm McLaren cowboys t-shirt from Seditionaries based on a Jim French drawing. In reality George O'Dowd,had not assumed the name "Boy George", at this time. He told me he was known as just George.